When You Finally Realize What You’re Doing Truly Makes a Difference! God Works in Mysterious Ways!!! Anyone who is brave enough to put their thoughts, feelings, emotions or stories on paper is truly taking a risk. The thoughts which have been floating around in your head suddenly become bound by the ink and the paper on which the words lie. No longer private in your own little world, but now valid and ready for the world to read. The world is a big place! Full of media mongers, haters, criticizers, and a highly sophisticated groups of melodramatic geeks who live on their computers just waiting to challenge you and what you have written. Sentence by sentence, word by word, they’re poised to pick you apart. What do you do? Stop? Quit typing and run? OH HELL NO! Write! Write! Write! Listen, there are always going to be people out there who want to take you down. Because they don’t believe in themselves, they will convince you that you shouldn’t believe in yourself either. It’s simple. We don’t eat the same thing as everyone else. We don’t wake at the same time. We don’t dress alike. We don’t even smell the same. So, the truth is, we are very different. We are going to have profound differences. This is why there is war! This is why racism exists. But, on the positive side of the coin, it is what makes us one piece of the human puzzle. If we were all alike, can you imagine how absolutely boring that would be? I have listed two different conversations…I as one character, and my daughter Carly as the other. ME: I love my new lipstick. It makes me look younger, don’t you think, I say questionably looking for affirmation. CARLY: Younger? She laughs. I really think you’re too old for lipstick. You are about to turn 47 right, sarcastically stated. ME: Well yes, but I still want to look pretty for Charles, speaking somewhat uneasy now that I’m aware of her disapproving opinion. CARLY: I would take it off Mom. People will make fun of you. They might think you’re a bit of a tramp,” she said assuring. ME: Do you love my new red lipstick, I question seeking approval. CARLY: Yes, she says in agreement. ME: Do you think Dad will like it? CARLY: Yes. Again, she replies agreeably pleasant. ME: But, do you think it could be a little more subtle? ME: Do you think I should wear it to dinner? CARLY: Yes. It would be lovely at dinner. ME: Don’t you think I would look beautiful if I outlined my lips in green, shave my eyebrows off and painted smiley faces on my forehead? CARLY: Yes. I think Dad would love that. are what makes the merry-go-round of life breathe and survive. computer off and go take a ‘yes man’ job. Trust me, there are plenty of these in the world already. But if you really want to make a difference…and you can…don’t be scared! Say what you want to say! That was quite a soapbox just to get to where I really wanted to go with this month’s blog. But you see, I grew up not believing in myself. And, when I started writing I still didn’t believe in myself. But, I felt compelled to do something outside of my comfort zone because I believed that God had a plan for me…to share his words…to share His love. Secrets of the Porch is an incredible story about healing and believing. He gave me the words and the incredible strength to persevere as I put the words down on paper. Since the book has been released, it has been getting great reviews, but 1,000 ‘Five Stars’ doesn’t compare to the review I received a few weeks ago. Folks, this is what it’s all about. It’s knowing that what you do makes a difference! It is sharing your thoughts, your dreams and your lives with others. Step outside to make yourself known to a neighbor who you’ve never spoke to before. Help an elderly person put groceries in their car. Or write a book, a story of love to share with strangers you may never meet. Yes, you will be judged, but only by your creator should you be concerned. Through me, He created Lila in Secrets of the Porch. She is beautiful emanating an unconditional love, yet non-comparable to His love for us. God Bless you for reading such a long blog and please read the review below. As my words touched SBR, yours too will make a difference. Keep on writing my friend! Much to my surprise, this cleverly concealed piece of Christian fiction tugged at my heart strings and struck a chord deep within me. Its 224 pages spoke volumes about life, love, and loss in a way that even someone like me could completely relate to and understand. The two central characters – sixteen-year-old Sophie and her seemingly perfect grandmother, Lila – stand in stark contrast to each other, though, taken together, they represent two threads of the same torn psyche. Between the two of them, they’ve been where I’ve been and seen what I’ve seen, and then some – yet, somehow, firm beliefs in God, faith, and love manifest in their story, while they’ve been woefully absent from mine, which begs a familiar question… Why? The answer spills from just about every page in this remarkably tender tone. Both Sophie and Lila brim with a sense of hope that I have not lost, but have abandoned, and each exudes an openness to possibilities, both earthly and divine, to which I have otherwise closed my eyes. I could say that I’m jealous of these fictitious females, but I am not. If anything, I’ve learned a great deal from them – and, even if you are battered, bruised, and broke, you probably will, too. They say God works in mysterious ways, and, hell, maybe He does. I received this book for free, in exchange for an honest review, and, in the end, I got a lot more than I bargained for. 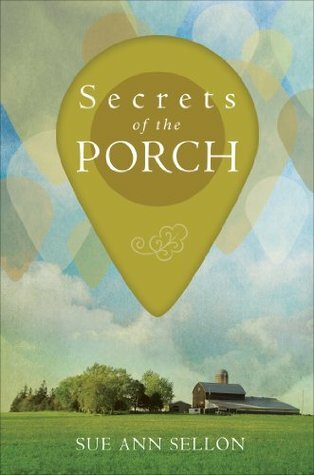 “Secrets of the Porch” truly was a gift to me, at exactly the right moment in my life, when I needed to be reminded that I am not alone, in any sense of the word, and that there is more to life than the dark shadows looming on yesterday’s horizon. Giveaway ends February 15, 2015. The Reality of Publishing…It’s a Crap Shoot!